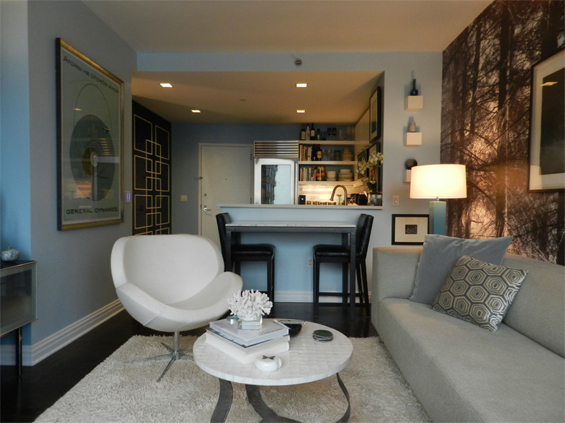 Dream House - Tips & Ideas For Small Spaces (Image Heavy!) - Sugar, Darling? 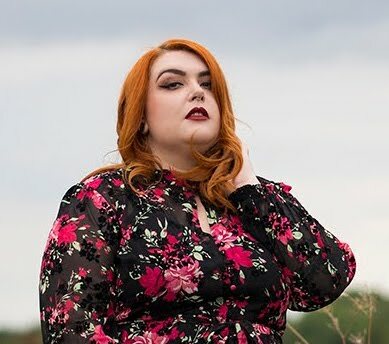 As my boyfriend Pete and I are currently saving up to buy our own house I'm spending a lot of time scouring the real estate listing in our area to see what available in our budget range. As that budget isn't that big and from looking at what's for sale at the moment we won't have a large house which depressed me a little at first (the curse of fawning over gorgeous big pads online and in movies) but this just means that we'll need to use the space we have very wisely for what we want. 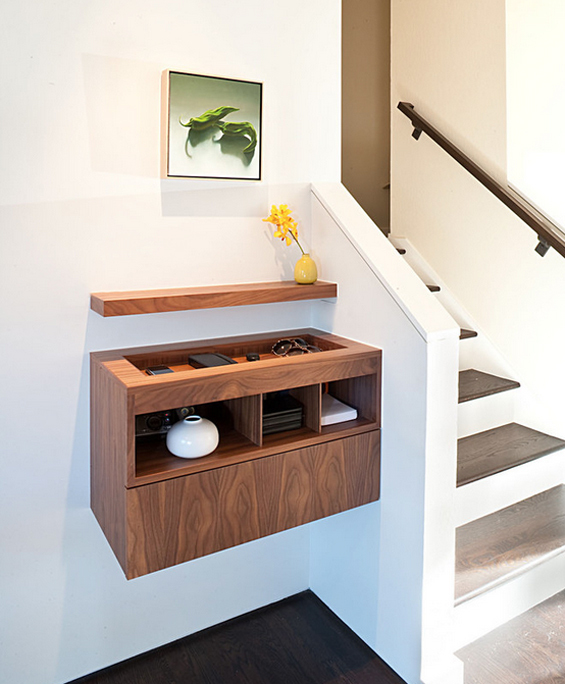 As this is something that a lot of us will have to think about due to the economic situation we are currently in I thought I'd share some photos I've collected while browsing Houzz that illustrate clever ways to utilise the space you have best. The room above I think is just gorgeous, but then again I would as it includes pink, velvet, gold and black and white stripes which are some of my favourite things. Other than this though it shows that even if you have to multi-task your living room to include a dining table it doesn't have to look odd and cluttered. The owners above have very cleverly managed to extend the comfy atmosphere to the dining area by keeping the colours in key with the rest of the room's scheme and adding cushions to the chairs. The pretty vase on the table and nice detail to the chair backs also make the dining area appear part of the scheme as it adds to the decoration of the room as a whole. This is another great example of how keeping objects in the room of the same colour scheme makes it appear much more planned out and stylish even if you are pushed for space. You couldn't argue with this room as you still have everything you would need with tables and storage in the sideboard and on the shelves. You are now seeing a lot more flats and apartments in the UK being built in a more open plan scheme as they do in the US, often integrating the kitchen and living room into the same space. The room above shows how correct placement of your furniture makes all the difference. There is even a dining table tucked behind the kitchen divider for if you have company over. Using a light colour scheme and keeping window finishings to a minimum so they let lots of light in also really help with making a room appear bigger. I thought this was a fab idea for adding a dining or work area to a room without taking up lots of valuable space. The slim table looks just lovely with bar chairs tucked under it and is so slim it could even be used in a hallway between rooms. I think this cosy dining table looks lovely built across the width of the room. I've always been a fan of the built in padded benching in restaurants so why not take this idea into the home to save space? Another example of a smart space saver is this wall mounted hallway organiser so you can keep your keys, sunglasses, gadgets and other items you'll need when leaving the house in one place without looking untidy. I imagine this one was pretty pricing but you could easily create something similar yourself just by mounting a cabinet on the wall and adding a pretty tray to its top. 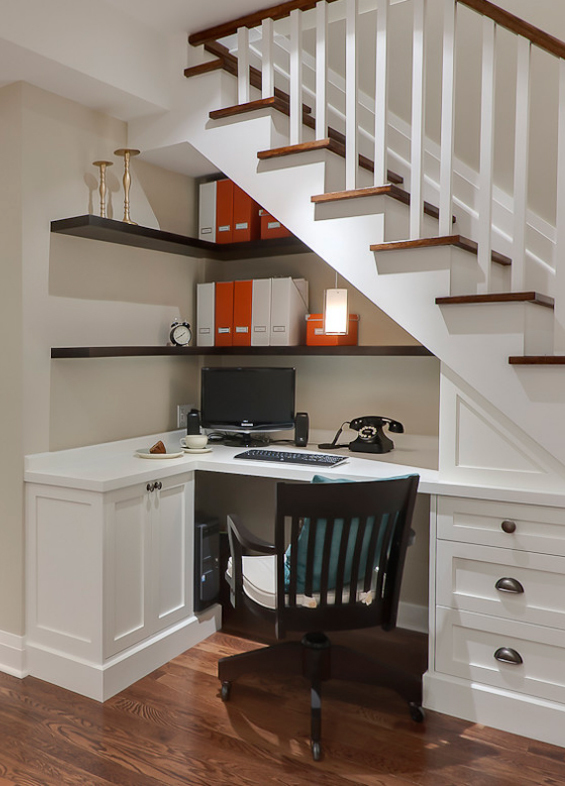 More smart hall way use here turning what would usually be the under the stairs cupboard into a stylish and functional office area - perfect if you don't want to sacrifice a whole room upstairs to being a work area. 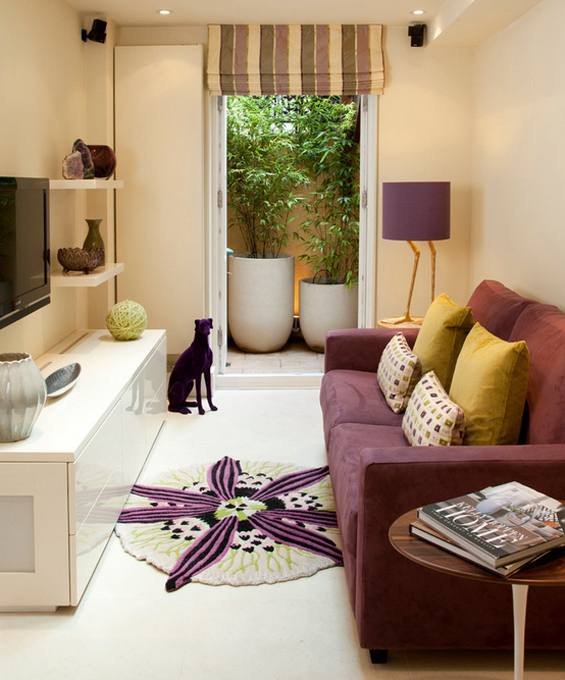 Just make sure you don't leave it untidy as it's the first thing guests will see when they arrive! If you are happy to have a whole room dedicated to work but only have a narrow space this would be a great idea utilising the whole wall space and giving lots of worktop room for computers, drawing boards, sewing machines, crafting supplies or whatever hobbies take your fancy. If we owned the house we live in now I'd get straight onto doing this in the room I am in at the moment! A small kitchen is one of my biggest fears, something I've had to conquer in the place we live now - being a little Victorian frame knitters cottage the kitchen is in an extension off the back of the house and is quite slim so I had to come up with some clever storage ideas to fit all my kitchen equipment and vintage glassware safe. The above room clearly has lots of storage space with the built in cabinets and shelving and the central butchers table island gives extra needed room for food prep without restricting movement too much. 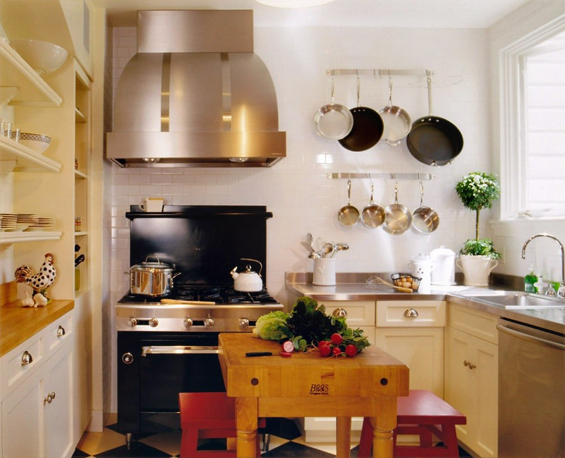 The pan racks on the walls are also a great space saving idea. 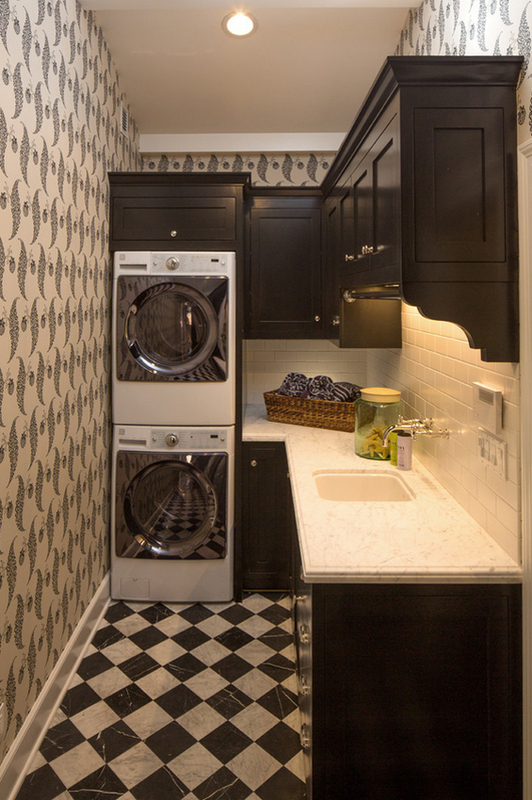 Because I am lame I dream of having a laundry room! Our washer dryer is currently in our kitchen with a hanging clothes drying rack suspended from the ceiling - a fabulous idea but when you need to cook before your clothes are dry they inevitable end up smelling like food, not good. This space would be ideal as you could wash and dry everything in the one room so it stays fresh and lovely, plus you wouldn't have the unsightly machines in your kitchen! I really wouldn't mind waking up in this lovely bed every morning even though it's tucked away in round a corner, if anything this makes it look more cosy. 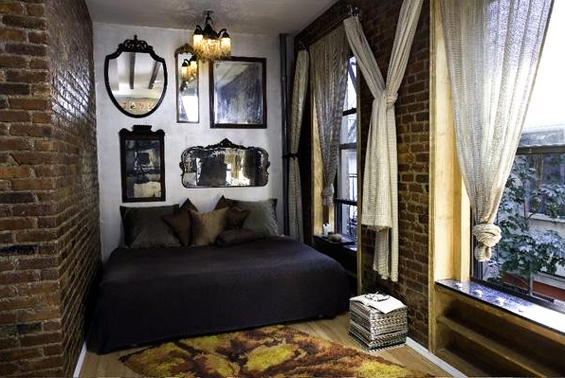 The mirrors are a great touch as is the rug making it look like a planned space rather than a 'this is the only place to stick the bed' space. I think the only downside would be changing the sheets with no room at the sides of the bed! 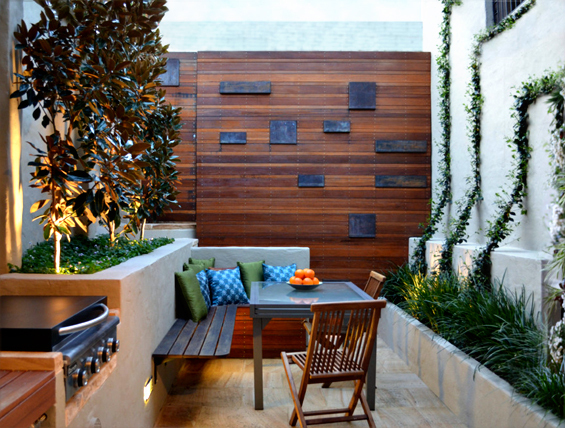 Small outside spaces can be great too and don't just have to end up as dreary forgotten spaces. Adding the planters means you can still have greenery despite the lack of grass and the built in benching means you can fit more people around the table than having just chairs. As we don't have weather that warrants proper outdoor kitchens I'd trade that built in stove top for a barbecue and then you're set for the Summer. You'll notice that a lot of modern houses in the UK have these long rectangular gardens that can seem a bit clinical and boring. 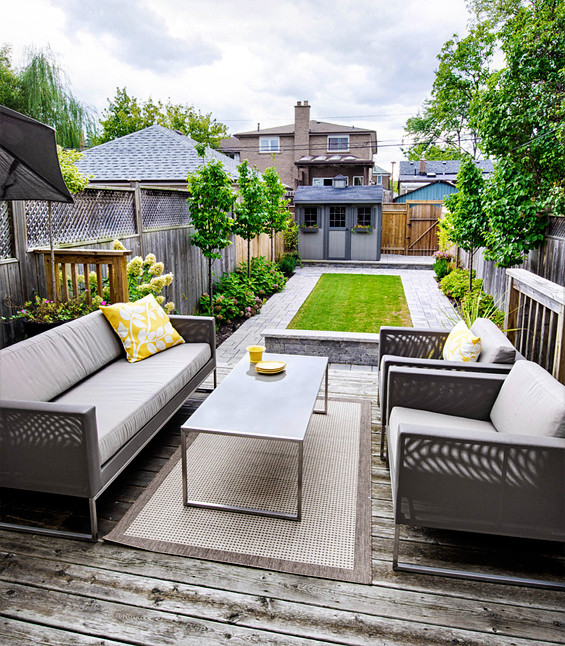 The image above however just proves that with some clever use of decking and paving and smart arranging of plants and furniture you can create a lovely outdoor space from them. It also shows that your shed needn't be a boring old splintery wood affair - just paint it to match the scheme of the garden and add a few window boxes or hanging baskets to tie it in with the rest of the scheme as you would a room. 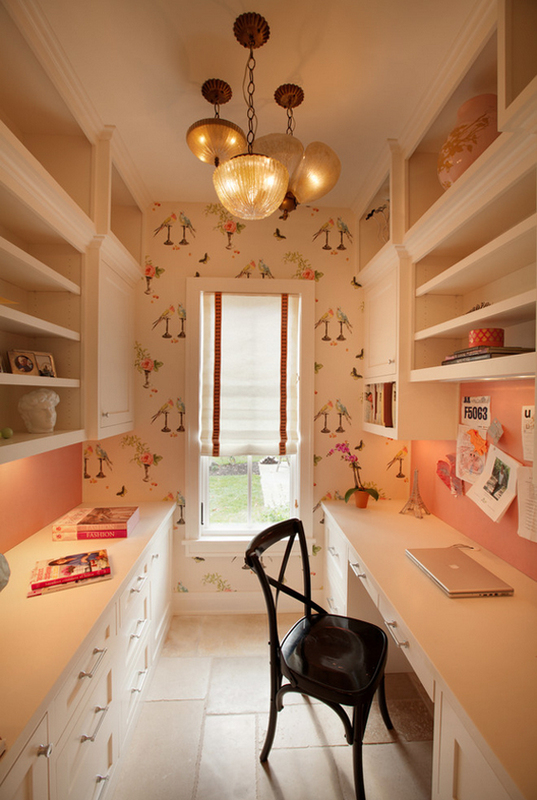 Do you have any tips for using small spaces efficiently? I'm making a scrap book of tips and ideas so I'd love to hear them if you do!